Are you struggling to stay productive at work? If so, you might be struggling with one of these bad habits and not realize it. There’s no judgment here. If you can recognize these habits in your routine, then you can begin to change them. Do you browse the internet while shifting between tasks? Reading random questions or watching interesting videos from the news can rob you of a lot of time. Try to reserve your web browsing activities to break times. Checking your email repetitively is a huge time waster. Not only does this force you to multitask, which robs you of productive time, you can also find yourself responding to emails instead of getting your work done. For most people, production levels decrease throughout the day. That means you’ll be most productive early in the morning (or at the start of your shift). If you use that time for conversation, coffee breaks, and other non-related work tasks, then you will struggle to get your work done. If you sit around all day, you’ll feel more tired. Try to move around for at least 5 minutes every hour. Elevate your legs as much as you can at your desk. Consider purchasing an under-desk exercise bike to keep the blood flowing. Even wearing compression socks can help with feelings of fatigue. Prioritize your tasks each day to make sure you’re doing the most important work right away when you have peak energy levels. Stay focused on the most important item on your to-do list throughout the day. If you hit the snooze button on your alarm regularly, then you may be going to bed too late. You might also be struggling with sleep issues that may require a medical intervention. If you use your phone or tablet in bed at night, you may experience additional sleep disruptions. Try to put the electronics away at least 30 minutes before going to bed. For maximum results, give yourself an hour to transition to bedtime. 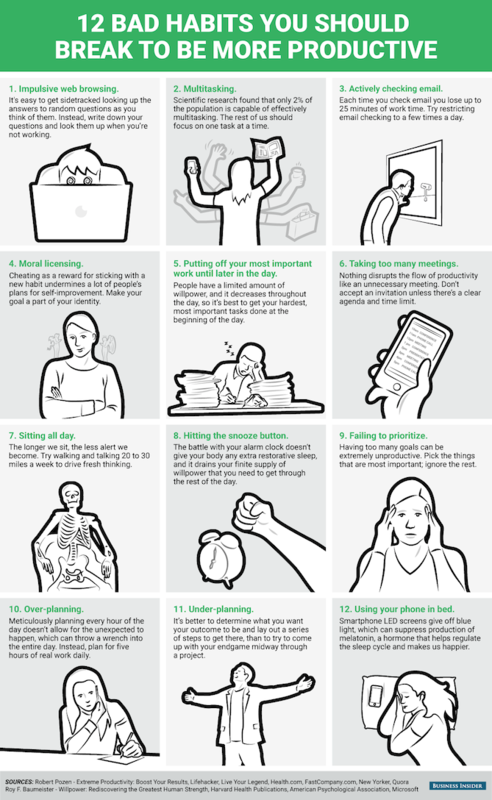 If you feel like you’re not being productive at work, then one of these habits could be the cause of your troubles. Identify the issue, create a plan, then make an effort to stay productive every day.